The mission of Think Outside the Basket Project is to educate and make our peers more aware about the risk and choices they make when it comes to food consumption and purchasing. It is also this project’s mission to come up with healthier and pocket friendly alternatives that can be accessed by any student. How can I make better choices about the food I consume? How can I have access to organic foods under a set budget? How can I make organic food more accessible for me and others on campus? This 5 unit Action Research Team will focus on the causes of food waste as they relate to the industrial agriculture system. We will analyze the causes of food waste as well as look at innovative solutions that are being put in place help solve the problem and use these examples to tackle issues of food waste in our own community. How does food waste arise in industrial/commercial food systems? hat impacts does it have on the environment & society? What can we do to implement solutions in our own community? Helping the campus’s goal of reaching zero waste by 2020. Development of interpersonal, leadership, facilitation, and teamwork skills to aid our goal. Educational and academic skills such as public speaking, brainstorming and peer critique are integrated into the course. What are the reasons people act for the environment? What are effective ways to publicly negotiate? How important is peer collaboration? In our ART we’re going to be exploring the history and contemporary politics of campus expansion and enrollment growth at UCSC, what it means for on and off campus living conditions and academics, and how it relates to the housing crisis, houselessness, and the growth of Silicon Valley. We’ll be tying all of this together through ethnographic research, art projects, and direct actions that amplify the voices of students, workers, and locals facing intensifying conditions. What are the roots of the issues people face amid the housing crisis? What might campus look like in the future? How can students use research and outreach to have an impact on housing conditions and decision-making? My name is Sophia, and the Action Research Team I will be leading is The Beauty Reform. This A.R.T. will explore the sustainability practices of the cosmetic world. I aim to facilitate a way to critically examine the world of makeup and see the affects makeup has on our physiology, environment, and even self esteem. We will also delve into the vast world of social media and study where common beauty trends originated, and if we agree or disagree with how beauty is currently portrayed in our culture. So if you're interested in cosmetics, beauty trends, or if anything mentioned seems slightly interesting to you, feel free to sign up! How does media perceive beauty? Are commonly utilized cosmetic practices healthy to our bodies and environment? What biases exist in our society based off our perception of beauty? A discussion of what it means to live sustainably in an Urban environment. Students will compare research done from different cities and analyze the use of alternative technologies to alternative technologies used to alleviate climate change. Topics covered: Energy conservation, urban food systems and food waste prevention, green building, transportation, community and social justice. 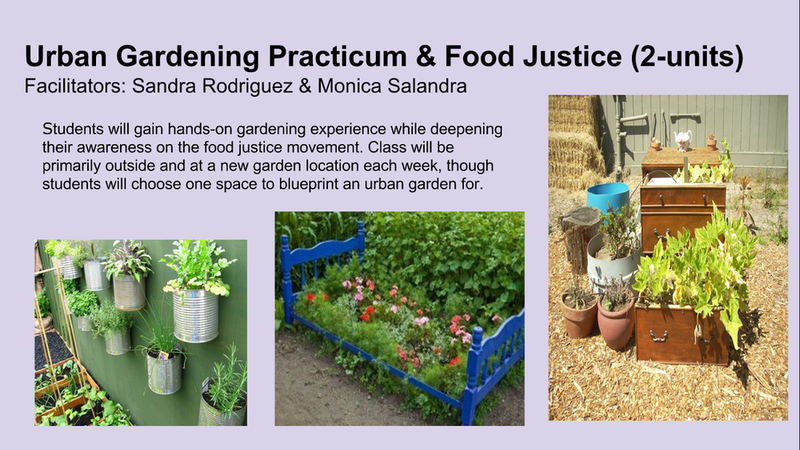 The goal of this class educate students alike about the problems that exist in conventional agriculture through discussions, projects, and hands-on learning in the garden. An exploration of holistic systems of healthcare and developing mindful practices that nurture the bodymind and the inextricable connection that exists within one's self, society, and environment. Students learn the principles of ecology and how they apply to the ecosystems represented on the UCSC campus. Through a combination of in-class and in the field time, students discover their ecological role on our campus and beyond. For Native Americans and Indigenous Peoples of the world sustainability doesn’t need a definition; it is a fundamental aspect of their cultural ethos. To address the physical and psychological disconnect between industrialization and sustainability we will turn to the wisdom of indigenous peoples of the earth, to learn and practice their ways of knowing. In this class we will examine the differences in consciousness that have allowed colonization, industrialization and globalization, and synthesize Indigenous knowledge with modern sustainability models to create direct and effective solutions to sustainability. Topics Covered: sustainable indigenous solutions, Indigenous practices with: water, food, waste, health, community, plants, animals, spirituality, and socio-economic relationships. 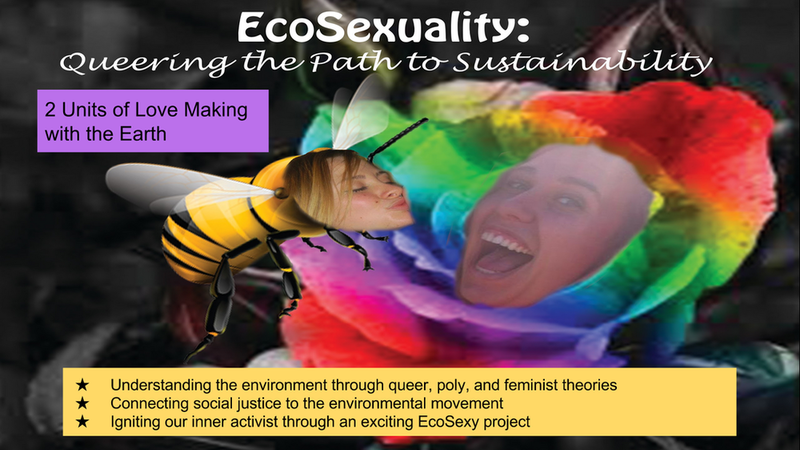 This class is for students who want to become active members of the Sustainability Movement. “Inspiring Sustainability Initiatives” is designed to give students the knowledge and experience needed to become an effective sustainability leader. Topics covered will include Sustainable Economics, Food Systems, Climate Change, Energy, Green Purchasing, Health, and Diet. Two workshops prepare students with hands on experience in both societal and personal agro-economic systems like farmer’s markets. Students will also be educated on current sustainability efforts at UCSC, locally, Nationally, and Internationally. This class examines perspectives on waste production and management. We will explore lead global contributors to waste (ie. textiles, food, plastic, E-waste, and landfills). Some projects will include clothes swaps, re-usable jars, thrift store projects and more. 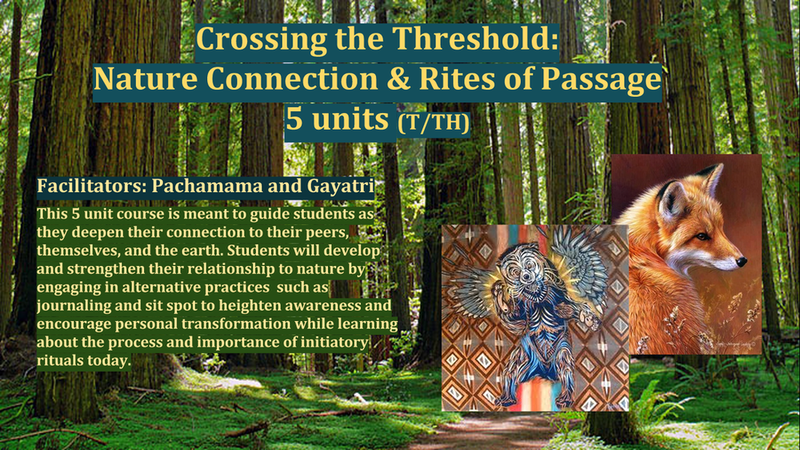 "The Multiversity: Collaborating Local and Global Transformative Paradigms"
This section is focused on bridging ancestral knowledge with modern societies to co- create regenerative and resilient paradigms. Students explore land stewardship techniques and different avenues of expression regarding nature and nature connection within the unique bioregion of Santa Cruz and the UCSC campus. Utilizing the 12 principles of Permaculture, students' cumulative knowledge of the subject will grow as we introduce the mental, physical, and environmental techniques of a Permaculture based lifestyle. These three topics will be brought together to form a complete understanding of learning gardens, and the potential they have to help shape the future. Students will gain hands-on skills to lower their dependency on a consumer biased economy.Students build a sustainable infrastructure in addition to an already existing garden or farm by working on the aquaponics system at PICA. Sustainable Sustenance will be to promote awareness of commercial animal consumption examined through a socio-economic, environmental, and ethical basis. The class will consist of an examination of the large-scale commercial meat industry, and how social, economic, and environmental trends have played a dynamic role in shaping the present, past and future of this multi-billion dollar industry. Students will gain a well-informed understanding of the generally overlooked process of how animal carnage is brought to the dinner table; and will be encouraged from an unbiased position to formulate their own opinions and actions through which the factory farming industry could potentially be revolutionized to promote a healthier planet for humans, the environment and the animals with which we share our planet . This class will seek to analyze the development and trajectory of the food system in the 20th and 21st centuries. We will specifically focus on how industrialization has impacted human rights, ecology, and community health. We will see how exploitation and ecological degradation are manifested in the modern food system while developing alternative models and tangible solutions. Students will start broad and focus in on working either on the UCSC seed library or another topic pertaining to social justice. We will create a space for students to explore the role of water in their daily lives. In this space we will learn about water as a finite resource and about practices that encourage responsible water-usage. Other aspects of the class will include going on a field-trip, engaging in discussions and hands-on activities, and leading a campus-wide water conservation program called Drop Your Own Drip (DYOD). Please visit dropyourowndrip.wordpress.com for more information about the project. This ESLP section is designed around waste materials management education. Waste materials management is a dynamic concept, for it represents specific practices and interpretations that vary on a global scale. 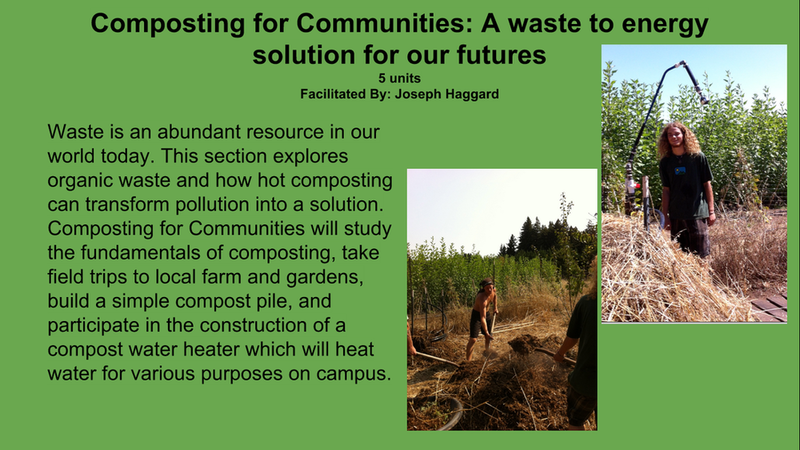 With the greater vision of local, environmental sustainability in mind, this class will focus on the waste management systems of Santa Cruz County and more specifically our own UCSC campus. In this context, our class will navigate through the details of organized, material recycling and recovery, the economic drivers behind such behavior and the individual decision-making that determines the entire process. At the same time, students will be involved in the organization of the campus residential student move out process. To organize and facilitate the "zero waste" student move out event, we will engage with the student body through multiple forms of communication, spreading sustainable waste management education and recruiting student volunteers for the event itself. The goal of our class will be to provide students with an in depth understanding of environmental sustainability and the way in which social movements have produced positive change within food injustice, animal preservation, and overall global health. Our class will look at the effects of social change, both positive and negative, and examine the ways in which individual participation and consciousness can promote a blueprint for a greener tomorrow. Together students will collectively produce and organize their own social movement to create positive change in our local community of Santa Cruz, California. We spend most of our lives in the built environment. This ESLP section is designed to allow students to use a lens of sustainability to view residential buildings on campus. 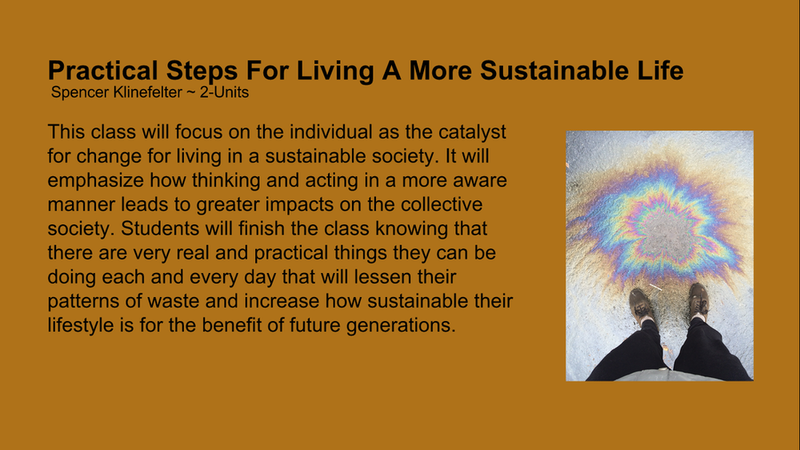 The Sustainable Living Spaces Audit Class is comprised of three main sections: starting by learning a foundational understanding of green building concepts, processes, theory, and practice, then conducting Stevenson Dorm Audits with UCSC-specific guidelines, and lastly, drafting a project proposal to improve the Stevenson dorms based on the audit results. The section’s deep integration with our very own built spaces is central to promoting a sustainable living community. Come gain hands on experience with permaculture, gardening, agroecology, and community! In this interactive workshop based class, we will create a more sustainable campus and world through our efforts as students. We will learn to live in harmony with Mother Earth, while creating an abundance of food, and wildlife habitat. We will learn to connect all aspects of our lives to a closed cycle of energy where nothing is wasted. Food for Thought explores both the current state of the current agricultural system as well as personal relation with food as avenues to both develop a structural lens and establish effective, compassionate practices.